Jacqui Katona and Yvonne Margarula, both Aboriginal women, stopped a damaging uranium mine at Jabiluka, land traditionally owned by the Mirrar people and at the heart of Australia’s largest national park. At the heart of Kakadu, Australia’s largest national park, lies Jabiluka, one of the world’s largest uranium deposits. It is also home to the Mirrar Aboriginal people, whose ancestors have lived in the area for more than 40,000 years. The plan to mine Jabiluka, thereby altering forever the fragile landscape, found vocal opposition in the Mirrar. Leading the passionate campaign were two aboriginal women, Jacqui Katona and Yvonne Margarula. Katona, a member of the Djok Aboriginal clan, served as executive officer of the Gundjehmi Aboriginal Corporation, a Mirrar-run nonprofit organization. 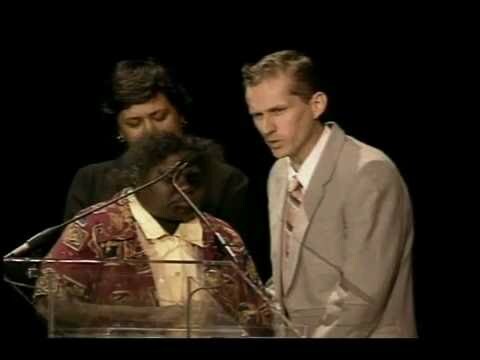 Margarula has served as Senior Traditional Owner of the Mirrar people and chairperson of the Gundjehmi Aboriginal Corporation. Katona and Margarula are blood relatives. Kakadu is a World Heritage site, one of only about 20 in the world based on both cultural and natural significance. The park contains 196 aboriginal art sites, reflecting the age-old cultural history of the area. Unique in its landscapes, biodiversity and rich ecosystems, Kakadu draws hundreds of thousands of tourists a year. Though within its borders, Jabiluka is excised from the park. The mineral lease for Jabiluka is held by the mining company Energy Resources of Australia (ERA), which operates the nearby Ranger Uranium Mine. Approval for mining Jabiluka was made by the Australian government despite the fact that mining within Kakadu is prohibited and in the face of opposition from the traditional owners. As well as destroying lands of great spiritual significance to the Mirrar and damaging the fragile ecosystem, the mine would unavoidably release tailings into the park that could remain radioactive for some 300,000 years. Jabiluka is one of several new uranium mines planned for Australia. The uranium is intended primarily for export, thus contributing to the international nuclear fuel cycle. The Mirrar people, led by Katona and Margarula, mounted a massive opposition campaign against Jabiluka, employing forms of protest ranging from legal action, education, and mobilization of national and international support, to traveling across Australia to garner support. At that time, an opinion poll found that 67 percent of Australians opposed the Jabiluka uranium mine. In March 1998, the Mirrar banded with environmental organizations to create a massive on-site civil disobedience, one of the biggest blockades in Australia’s history. Over a period of several months, approximately 5,000 people from across the country and overseas traveled to the remote camp to protest in solidarity with the Mirrar people. In July the land was cleared by ERA and construction on Jabiluka began; however, protesters intervened and approximately 550 were arrested, including Margarula and Katona for trespassing on their own land. Katona recently served a prison sentence as punishment for this violation. Thanks to lobbying efforts on the part of Katona and Margarula, the World Heritage Committee sent an inspection team to the mine site in October 1998 to assess threats to the area, with the intention of declaring Kakadu a World Heritage site “in danger,” a move that brought significant international awareness to the campaign.